If you don’t know anything about the Boxer Rebellion (or Boxer Uprising) in China from 1899 to 1901, this fantastical two-volume graphic novel is a fun and educational primer! Gene Luen Yang, who is currently serving a two-year stint as National Ambassador for Young People’s Literature, wrote this amazing duology about two young people living through the rapid globalization and Christianization of China at the beginning of the 20th century. The first volume, Boxers, tells the story of Little Bao, a boy who loves traditional Chinese theater, his village, and his father. When the “foreign devils” – Christian missionaries – come to his village and smash a statue of the local god Tu Di Gong, Little Bao begins to understand that his way of life is under threat. He seeks out martial arts training from a mysterious man named Red Lantern, who inspires the men of the countryside to protect their Chinese traditions from the encroaching foreign devils. Later, Little Bao trains with Master Big Belly, who reveals the secret ritual that gives him the power to defeat his enemies. With this priceless knowledge, Little Bao takes over where Red Lantern left off, training the men of his village in martial arts and teaching them the ritual that turns them into powerful gods during a battle. Little Bao and the young, poor men from the Chinese countryside form the Society of the Righteous and Harmonious Fist, travelling from village to village, killing British soldiers, Christian missionaries, and the “secondary devils” – Chinese Christian converts who flee from the roving Society army. The weeks-long battle in Peking, the heart of the Chinese kingdom, end badly for the Society of the Righteous and Harmonious Fist, and for Little Bao, who could never seem to reconcile his love for China with his understanding of justice and fairness. In Saints, the second volume of this duology, Four-Girl is the much-abused and neglected daughter of a widow in the Chinese countryside who seeks out Christianity for some strange reasons. At first, she thinks that she is meant to be a devil, a malevolent presence in her little village. Through her relationship with the local acupuncturist, Dr. Won, she learns about Jesus Christ (and has a free supply of cookies to sate her hunger). Four-Girl drifts farther away from her family and closer to the Church, though she feels no real connection to Christianity. In the woods one night, Four-Girl meets a strange girl, clad in armor, who she later learns is the spirit of Joan of Arc. With the vision, Four-Girl begins her full conversion to the Christian faith, taking catechism classes and ultimately choosing a new name, a real name: Vibiana. Vibiana is cast out by her traditional Chinese family and finds refuge in a walled village far from her home. The growing threat of the Society of the Righteous and Harmonious Fist bring more Christians and missionaries to their little enclave, where Vibiana helps watch over the orphans. Restless, Vibiana seeks out the vision of Joan of Arc and decides to become a maiden warrior for God. When the Society overtakes the village, Vibiana stands steadfast in her faith, even as Bao raises his sword to strike her down. Yang’s visual storytelling is out of this world; his use of crisp, clean lines and pops of bright color lead the eye from one action-packed frame to the next. This glimpse into the little-known Boxer Rebellion, from the points of view of both a Boxer and a Chinese-Christian convert, will make you want to learn more about this important event in Chinese history! Fans of Marjane Satrapi’s Persepolis and Hope Larson’s Mercury will love the story and artwork in this wonderful duology. Check these books out in the library today! Another Year, Another Lit Mag! 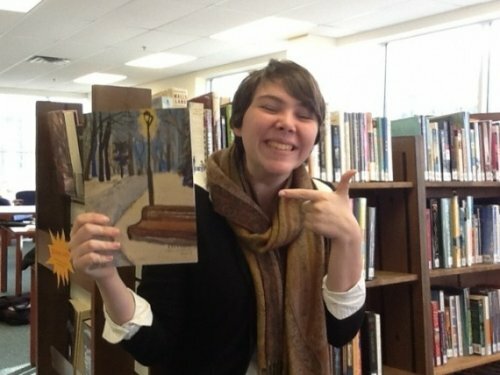 Volume IV of the Literary Magazine was a little tardy this year, but it’s more beautiful than ever! 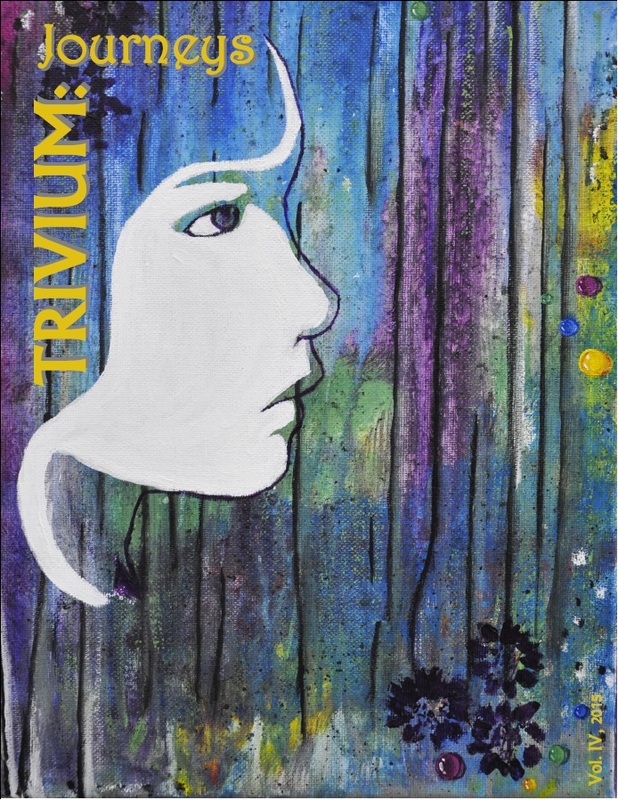 Trivium: Journeys is now available in print and digital formats for your enjoyment. If you find yourself at the school, drop by the front office or the library for your very own copy of the Lit Mag. If you just can’t wait to get your hands on a print copy, check out our digital Lit Mag by clicking HERE! Students in Mrs. Engles’ Creative Writing classes have gotten in on the fun as well! A few of her classes enjoyed making blackout poetry to get ready for Poetry Out Loud. *Note to all: DO NOT make blackout poetry with books that don’t belong to you! Originally posted on Oct. 24, 2013 on http://www.indiancreekschool.org. Ryn proudly shows off her copy. In Latin, “trivium” is defined as a crossroads or an intersection. This year’s literary magazine, written, compiled, and published by Indian Creek Upper School students, is an intersection of poetry, fiction, essays, and art. Keira Henderson’s (’11) “Something’s Missing”, a short personal account, is the first piece and sets a somber tone for the magazine. Hers is the story of a little girl suffering from feelings of abandonment wrought by a neglectful father. Keira’s story is accompanied by an image of a clay sculpture, Snakebear in Blue, by Sarah Zuech (’14), who created a hard blue face that compliments the tone of Keira’s story well. Sam Ruff’s (’13) “Ripples” is a free verse poem that begs for a change in a world of violence. Maria McGurrin’s (’11) clay Angel, soft yellow and white against a black background, accompanies Sam’s poem. Linnea Miller (’12) demonstrates her talent for description in “Climbs and Falls,” her short story about an arduous trek up a mountainous sand dune and the reward that awaited her at the end of her journey. Trevor Jameson (’11) channels Dr. Seuss in his poem “Slumped,” a call to action which seems to directed specifically at graduating high school students who need a little pick-me-up. Katy Gilles (’11) addresses a 21st century fear in her essay “Why the Artificial-Intelligence Driven Apocalypse is Definitely Going to Happen.” Her view of robotic technology and its eventual outcomes is full of wit and sarcasm incorporates plenty of pop-culture references. These are just a small sampling of the wonderful works that you will find in Trivium, available in the David G. Richardson Library and scattered throughout Indian Creek Upper School. Pick up your copy today! Trivium was edited by Linnea Miller (’12), Caroline Grindrod (’13), Nikole Rocha (’12), Daniel Schelb (’11), and Ryn Seidewitz (’13). Mr. Chip Voros acted as Faculty Advisor. Originally posted on Feb. 8, 2012 on http://www.indiancreekschool.org.